All Care Visiting Nurse Association showed off its new $9 million Market Street building to elected officials and local business leaders Thursday, including state Rep. Steven Walsh, who applauded the VNA as "the first major company in a long time to say, 'We're going to put our foot down in Lynn.'" Mayor Judith Flanagan Kennedy and other officials applauded the VNA for bringing new jobs into Lynn and making a commitment to continue doing business in the city. The four-story building at Market and Broad streets consolidates former All Care offices in Lynn and Wakefield. All Care President Shawn Potter said 175 employees work in the building and more than 400 other workers who travel across the North Shore daily providing in-home nursing care and other services also spend time in the building checking work schedules, filling out paperwork and attending training sessions. Following a morning ribbon-cutting with Walsh, Kennedy and other officials, Potter credited VNA workers with making the building construction project possible. "If they had not worked as hard as they had over the last several years, (it) wouldn't have been possible," he said. Two local City Council members praised the VNA for bringing jobs into downtown Lynn and beautifying a former vacant lot located on one of the city's busiest intersections. "Anytime we're bringing people into downtown, it's a positive thing," Councilor at large Daniel Cahill said. Ward 5 Councilor Brendan Crighton said he hopes workers in the new building will shop downtown and eat at local restaurants. "This is a great thing for the city and huge for downtown," he said Thursday. Developer David Solimine Jr. said the brick building with its panoramic rooftop view of Boston and Lynn Harbor "blends in nicely in the neighborhood." Potter said VNA representatives and Massachusetts Bay Transportation Authority representatives started discussions three years ago on All Care acquiring the lot next to the Market Street commuter garage. The MBTA picked All Care through a bidding process to build on the site and construction began in January 2011. Employees started working in the building on Jan. 16. 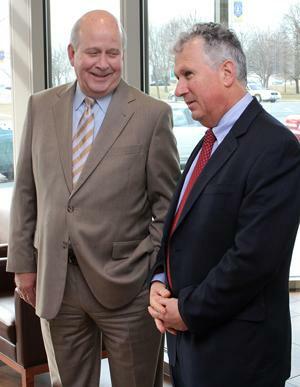 State Sen. Thomas M. McGee called All Care's decision to build its headquarters downtown "a major investment" in Lynn. Walsh said providing nursing services and other help to people in their homes is becoming a major sector in the health-care industry. "This building is truly about the future," he said. Potter said All Care is prepared to pay the city in-lieu-of-property tax payments of $80,000 over the next five years and $30,000 annually beginning in the sixth year. City Assessing Director Peter Caron said city assessors have determined the VNA is a charitable organization under state law exempt from paying property taxes. Potter said All Care representatives "felt we have an obligation" to make the payments. Mayor Kennedy said All Care's payment amount is still under negotiation. Economic Development and Industrial Corporation Director James Cowdell said the former vacant lot where All Care built its headquarters was identified in a 2007 city waterfront master plan as "a key site" for development. Cowdell said All Care's decision to build on the land "keeps people downtown and keeps this company in Lynn." "Those are all positive signs," he said. Potter said the VNA will host an open house on June 13 from 4-7 p.m.
"We're so proud we want everybody to come by and show off the building," Potter said.